The 2010 Ford Cobra Jet is an extremely limited production car, built for NHRA Stock and Super Stock Racing. From its beginnings in 2008, the car just keeps getting better. 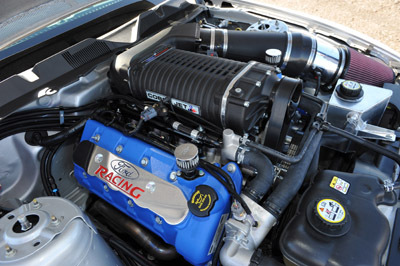 The 2010 Mustang Cobra Jet features race car only pieces to make it race ready from square one. The CJ includes a 5.4L DOHC (dual overhead cam) supercharged engine with a 6 speed manual transmission or 3 speed automatic transmission. The 2010 Ford Cobra Jet is readily identified by it's distinctive graphics package, wide rear Hoosier drag tires and skinny front Hoosier fronts, as well as its purposeful bulging hood and serious looking front bumper fascia. The Cobra Jet interior is a race certified interior, designed to comply with NHRA stock eliminator rules and includes a rear seat delete. The 5.4 liter engine features a Cobra Jet cold air kit, Cobra Jet throttle body, an SFI bellhousing, stainless steel long tube headers and air conditioning delete. Two versions of the engine are available, the base, if you can call it that, is rated at 425 hp and the optional aluminum V8, which pumps out 475 horsepower. To get that power to the drag strip, fully race prepared transmission was added. The suspension is decked out with race calibrated shocks at the front and rear. Steering and brakes are manual, to reduce weight and the battery is located in the trunk for better weight distribution. A trunk mounted fuel cell keeps the driver protected against unexpected surprises. One very cool and high-end addition for the 2010 Mustang Cobra Jet car is an included factory launch control and rev limiter. As compared to say, a line lock unit, the control allows the driver to preset the desired launch rpm and then just hold the pedal to the floor, while maintaining the desired rpm level. Like it's 2008-2009 predecessor the Cobra Jet Mustang is manufactured at the Auto Alliance International factory in Flat Rock Michigan. With a maximum of only 50 cars being produced, it's great for enthusiasts to know that all the pieces can be purchased directly through the Ford Performance parts catalog. Also like the earlier cars, the easy way to tell if one is a factory car, is that the car has a serial number and no VIN number. Ford has a way for you to win a brand new customized 2011 Ford Mustang GT with its awesome 412 horsepower V8. Don't miss this! Here's a link to all the details of the Mustang 5.0 Fever Sweepstakes and how to enter.